Í byrjun febrúar hittust ARKIR á daglöngu námskeiði hjá listakonunni og bókahönnuðinum Åse Eg Jørgensen, en þessar vikurnar stýrir hún þematengdri gestavinnustofu, „Printing Matter“, í listamiðstöðinni Skaftfelli á Seyðisfirði. Þetta er í annað sinn sem Skaftfell skipuleggur vinnustofu með Åse, en þar er rýnt í prentaðferðir og bókverkagerð og gerðar tilraunir með þá miðla. Åse er ein af aðstandendum listaritsins Pist Protta og útgáfunnar Space Poetry sem hefur aðsetur í Kaupmannahöfn. Við ARKIR njótum góðs af ferðum Åse til Íslands og þetta er í annað sinn sem við setjum upp litla vinnustofu í tengslum við heimsóknir hennar til landsins. Að þessu sinni gerðum við m.a. tilraunir með liti og prent úr heimafengnu grænmeti, skoðuðum endurtekningu og mynstur, samhengi og þræði, náttúruliti og tóna. Myndir frá fyrri vinnustofu sem fór fram tvo daga í janúar 2017 má sjá neðar á síðunni, en þá rýndum við í letur og leturform. Early in February ARKIR met in a one-day-workshop with Danish book artist and designer Åse Eg Jørgensen, who is currently leading an artist residency program at Skaftfell Center for VIsual Art in Seyðisfjörður. This year’s thematic residency program in Skaftfell is “Printing Matter”, a three-week intensive program focusing on printmaking and artist book making. 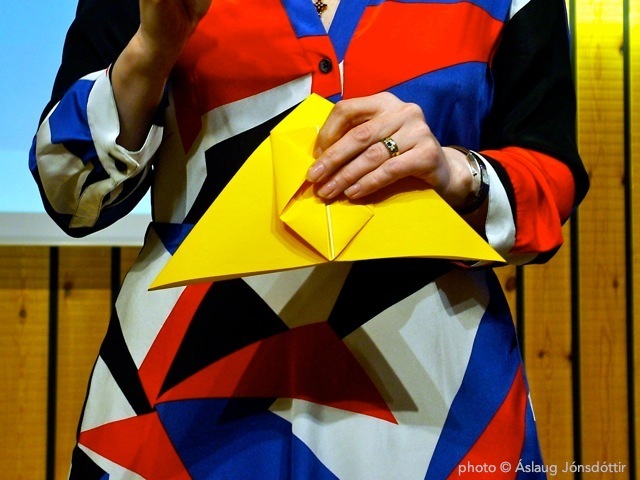 This is the second time Skaftfell arranges an artists book program with Åse Eg, who is one of the founders and possessor of the Danish experimental art magazine Pist Protta and Space Poetry Publishing. ARKIR have been able to arrange short workshops with Åse in connection with her trips to Iceland, this year and in 2017. This time we did experiments with colors and prints from local vegetables, studied the notion of thread and repetition, patterns and natural colors. In January 2017 we had a two-days workshop studying letters and letterforms, see photos further below. ARKIR á bókverkanámskeið með Åse Eg Jørgensen í janúar 2017. 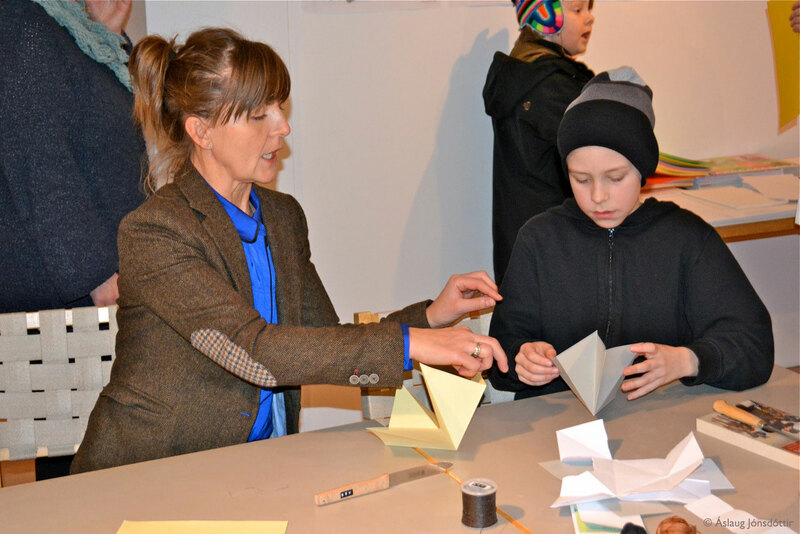 Happy ARKIR in a book art workshop with Danish artist Åse Eg Jørgensen in 2017. Á Safnanótt, föstudagskvöldið 7. febrúar, stóðu ARKIR fyrir leiðsögn og bókagerðarsmiðju í tengslum við sýninguna HEIMA í Norræna húsinu. Fjölmargir gestir nýttu sér ókeypis aðgang og óvenjulegan opnunartíma safnanna allt til miðnættis. 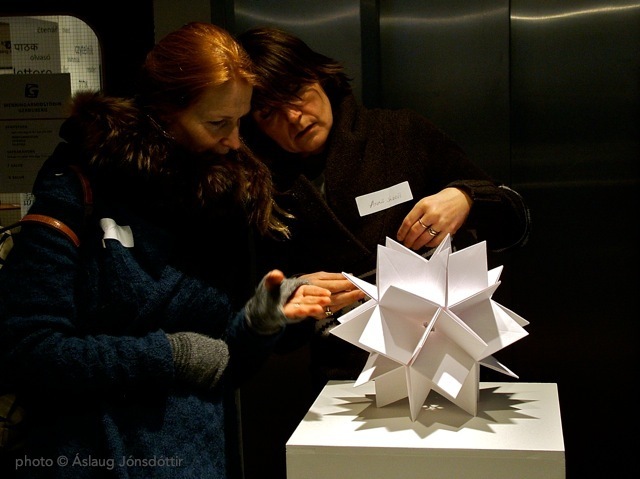 Art lovers enjoyed Museum Night on Friday night, February 7th, at Reykjavík Winter Lights Festival 2014. 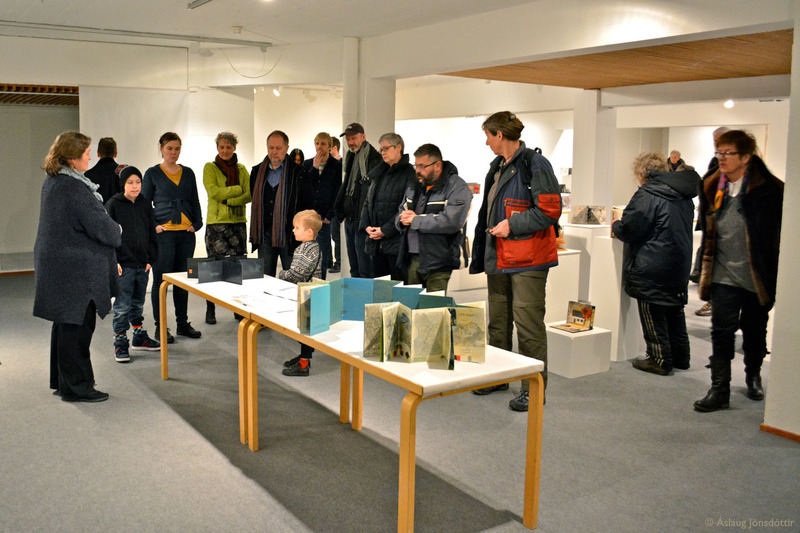 ARKIR invited guests to a guided tour around the book art exhibition HOME in the Nordic house, as well as giving a free workshop in book making. Now where is this going …? Við sýningarsalina í Norræna húsinu má áfram finna leiðbeiningar að einföldum bókarbrotum, pappír og aðstöðu til bókagerðar fyrir gesti sýningarinnar. Skoðið sýninguna HEIMA og prófið bókarbrotin! 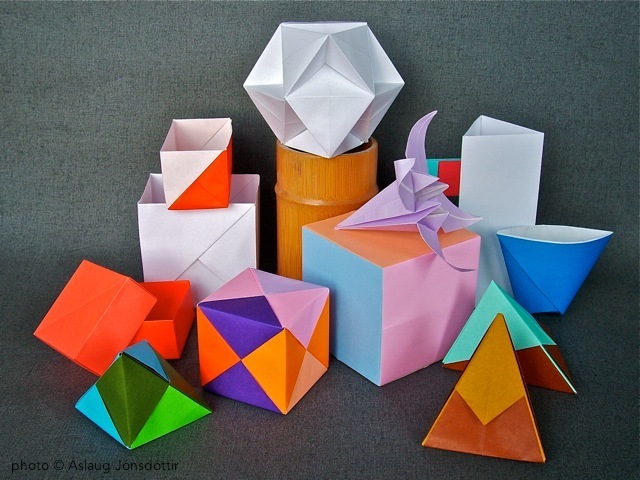 Paper and the easy-to-follow instructions are still available for guests in the Nordic house if you care to try out some simple origami book folding. See the exhibition HOME and get inspired! Í síðustu frétt greindum við frá bókverkanámskeiði sem þá var í vændum í Gerðubergi. Rebecca Goodale sýndi bókverk og hélt námskeið í lok ágúst. ARKIRNAR Inga og Sigurborg tóku þátt í vinnustofunni og hér fyrir neðan má sjá dæmi um bækur sem þær unnu á námskeiðinu. Einnig má sjá ljósmyndir frá námskeiðinu á heimasíðu Gerðubergs eða heimasíðu ljósmyndarans. Dear readers! 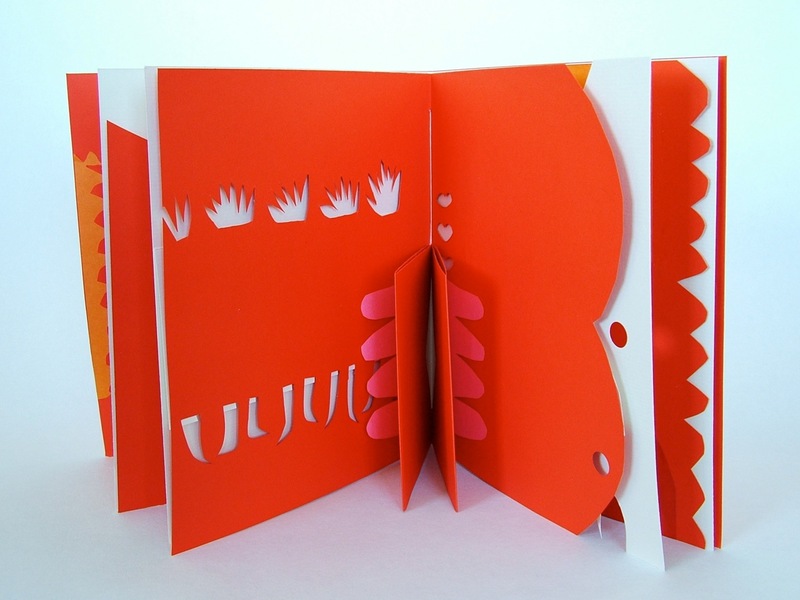 You have been missing news about ARKIR’s book art, haven’t you? Now, where were we …? As our last post was to let you all know about Rebecca Goodale’s workshop and exhibition in Gerðuberg Culture Center in August, it’s only proper to give an update on the event. 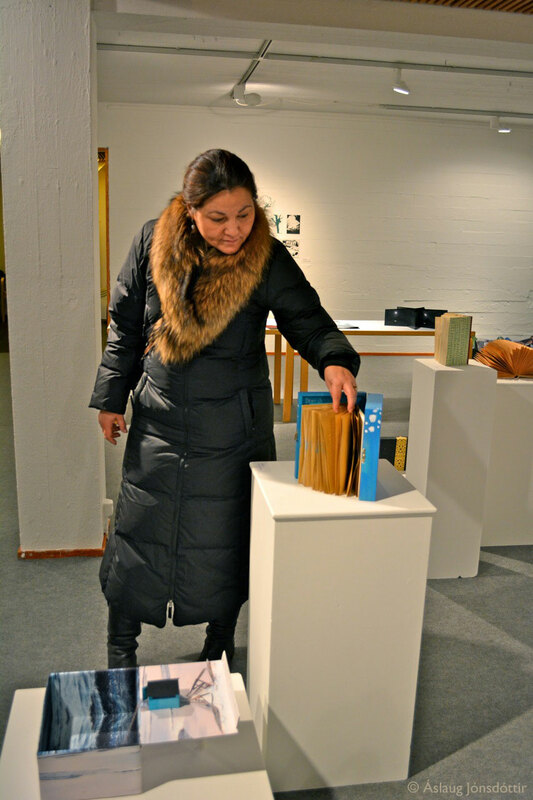 Busy as we all are, only two of ARKIR members made it to Goodale’s course in book art. 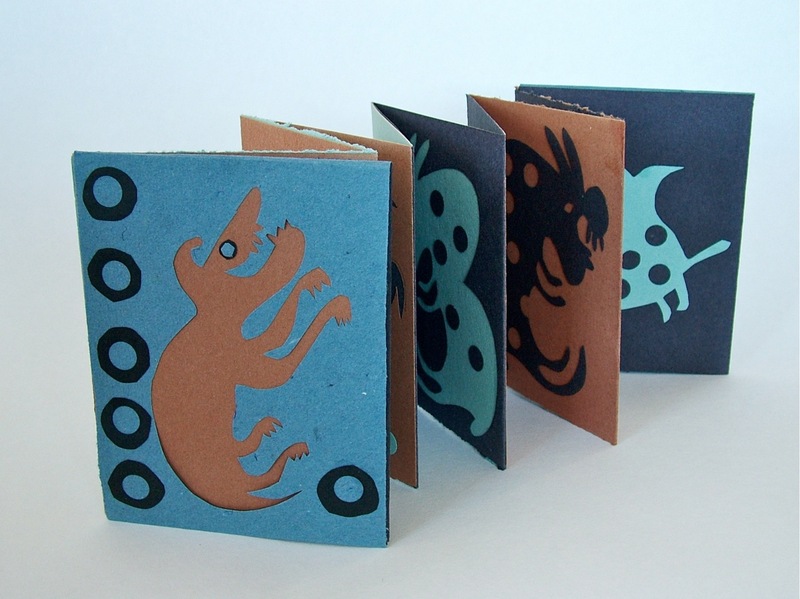 Inga and Sigurborg enjoyed the workshop and tried out different type of book forms and bindings. See photos below. 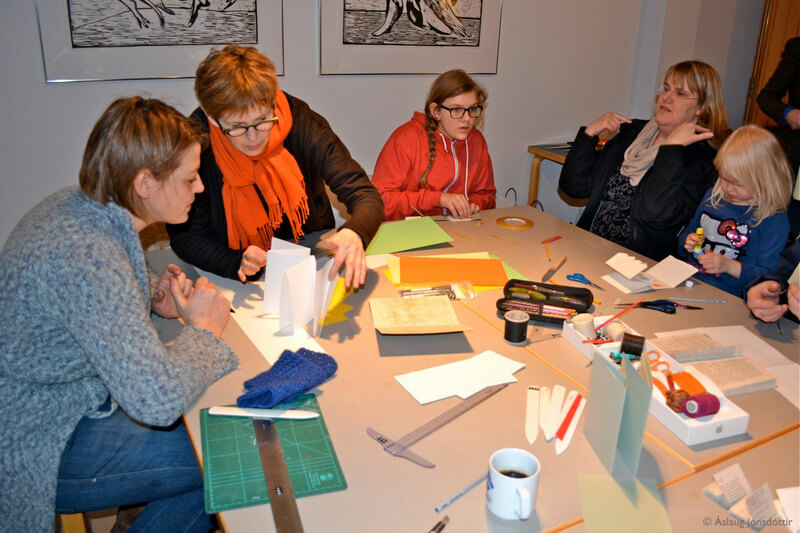 There are also very nice photos from the workshop at Gerðuberg’s website or at the photographer’s website. Rebecca Goodale verður með þriggja daga námskeið í bókverkagerð í Gerðubergi 24.-26. ágúst 2012. Lesið meira um námskeiðið hér. Á sama tíma verður hún með sýningu á verkum sínum. Gullið tækifæri fyrir bókaverkafólk til að kynnast nýjum aðferðum! Hér er einnig stutt myndband. 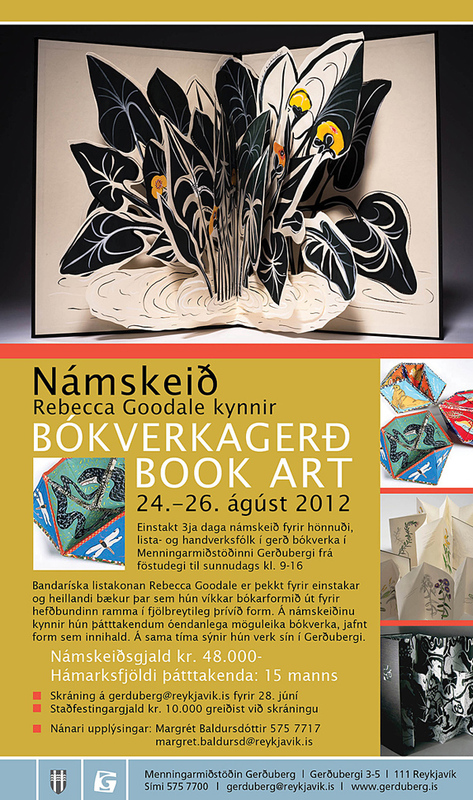 Rebecca Goodale gives book art course in Gerðuberg Culture Center, Reykjavík, 24.-26. of August 2012 and exhibits her work same place. (Further reading in Icelandic here and a short video here.) Something to look forward to!